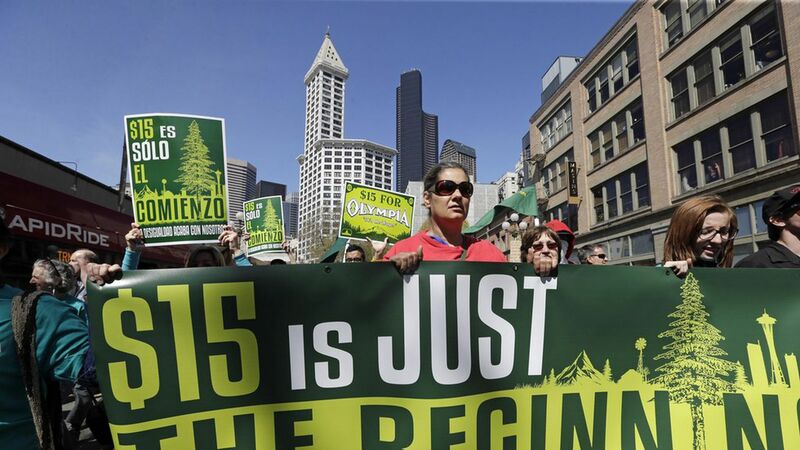 Seattle has been the vanguard of the newly energized minimum wage movement, hiking its pay floor from $8.55 in 2010 to between $11 and $15 in 2017. Other cities have followed suit — in all, nine big cities and eight states have passed minimum wages between $12 to $15, depending on the size of the employer and other factors. Berkeley's Institute for Research on Labor and Employment is out with a new study on the effects of Seattle's wage policies, and found that there was no job loss as a result of the mandate. How did they do it? They uses an algorithm that tests combinations of different counties across the U.S. to create a "synthetic" Seattle, mirroring its employment and wage characteristics for six years. The only difference is that these counties did not increase their minimum wage. What they found: There was no negative effect on employment, even up to a wage floor of $13, a much higher level than previous research has studied. Not so fast: The authors of the study admit that their synthetic Seattle may be failing to reflect important qualities about the real Seattle that could be preventing job loss. The IRLE plans to conduct similar studies in Chicago, Oakland, San Francisco, San Jose and New York City, and elsewhere, which will help respond to this critique.